Earlier this year I enumerated my antenna siting options, discussing their relative merits, and showing each on a diagram. Since that time I have installed a short tower at Site-C (for the low band antennas), eliminated sites A and D (for a variety of reasons), and built a support mast at Site-B. I temporarily installed an experimental 20 meters delta loop at Site-B. When it failed to meet my needs and expectations it was removed and dismantled. Site-B remains a good one for wire antennas, so all is not lost. I proceeded to plan and construct a mast for wire antennas, one that would be affixed to the 6 meters high base steel pipe. Of course life got in the way, so this took some time to get underway. I have also been under a deadline since on September 3 a work crew arrives to erect scaffolding all around the house to start on needed maintenance to the house siding. That would delay progress until the last half of September. I wanted to avoid that delay. In a flurry of activity this long weekend I manged to finish construction of the mast, install it and also test and tune an antenna. In fact I barely got the antennas, rope and tools put away before a thunderstorm struck. The antenna I put up at present covers only 20 and 17 meters, which I'll describe in my next article. It deserves separate treatment. Besides which I have had little opportunity as yet to use it much. In this article I'll stick to the mast construction and erection, and a little about antenna construction. In the picture you can see where the original steel-pipe mast just clears the top of the eaves. Mounted on it is an 8.1 meters high mast (27.5'), consisting of 2 nested 4' fibreglass sections and a 20'-long aluminum mast. It tops out at about 14.1 meters (over 46') above grade. Unlike the Site-C tower which is not easily visible from the street, this mast caught the immediate attention of many of my neighbours. There was interest and curiosity, but no complaints. Of course complainants rarely choose direct confrontation, so time will tell. I really do not expect any conflict to arise. As with the delta loop, I installed the mast by securing myself with a safety line and harness, then standing at the edge of the roof and lifting the 8 meters plus contraption -- complete with mechanical add-ons and various ropes -- straight up into the air and plugging it into the steel pipe. This is easier than it sounds! Unlike the delta loop which has a full fibreglass mast, this one is lighter and easier to manoeuver. In fact with just a little bit of arm and back strength it can be manually lifted from one end and swung up to its vertical orientation. One just has to move it with care once it's airborne since it does oscillate back and forth and could throw you off balance. The fibreglass sections nest nicely into the 1-½" Schedule 40 galvanized pipe. The duct tape I used as a shim to improve the fit was replaced -- it proved to be too sticky and would likely weather poorly -- with a thin sheet of aluminum, a big roll of which I had in my junk box. A hose clamp (visible as a bright spot in the photo) secures it so that the shim doesn't pop out with the mast when it is subsequently lifted out. 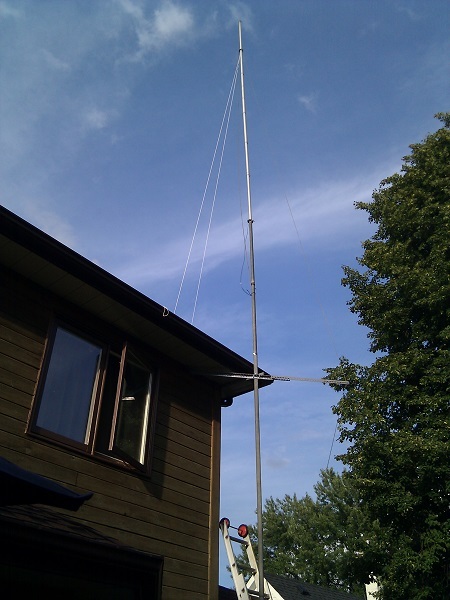 The aluminum mast is the boom of a 1λ-long yagi for 6 meters. Up until 1992 it enabled me to accumulate many DXCC countries on the "magic band". The elements are gathering dust in the garage. Since it's a yagi boom it is widest at the centre, not the bottom. However this allows it to fit almost snugly inside the fibreglass mast. A mast clamp acts as a stop to prevent it sliding too far into the fibreglass section. The clamp also secures an aluminum sheet shim, and a length of #12 wire. The wire is there for "future consideration", which I'll talk about when I get around to using it. Near the top is a guy ring that fits neatly just where I want it on the mast. There are 3 rope guys to stabilize the mast. The mast is very flexible and I need their help to keep the mast vertical when the antennas are pulled towards their anchors. The guys ropes are light duty, which is all that's required in this application. One thing I did was add an extension angle steel to the pipe bracket so that the rightmost guy can be more effective. That guy attaches to an anchor lower down the pipe. At the very top is a pulley. This allows me to adjust and modify the wire antennas without pulling down the mast each time. The pulley is very small, sized to match the rope that pulls up the antenna. While it is a topic all its own I will just mention that you should never use a pulley that is oversized to the rope. If you've every had a rope get trapped between the wheel and pulley housing where it is far out of human reach you'll understand what I mean! 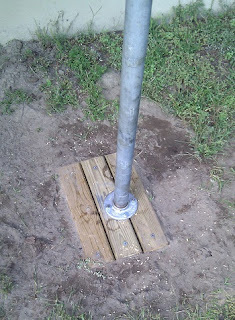 For the steel mast I finally installed a permanent base. As you can see from the picture it is a smaller version of the floating base that I designed and build for the Site-C tower. Since I strategically positioned the threaded side at the bottom (the other threaded end was previously cut off) I bought a galvanized floor flange as a suitable interface between pipe and base. The mast is off-centre since the vertical alignment must have been a bit wrong on the temporary base. The only negative impact is one of aesthetics: it doesn't look pretty although its performance is the same. The antenna that I put up is, as I said, the subject of the next article. I will describe the mechanical and electrical construction of the antenna's core now since it is closely related to the construction of the Site-B mast. The attached picture show the key elements of the construction. It centres on the plastic insulator. 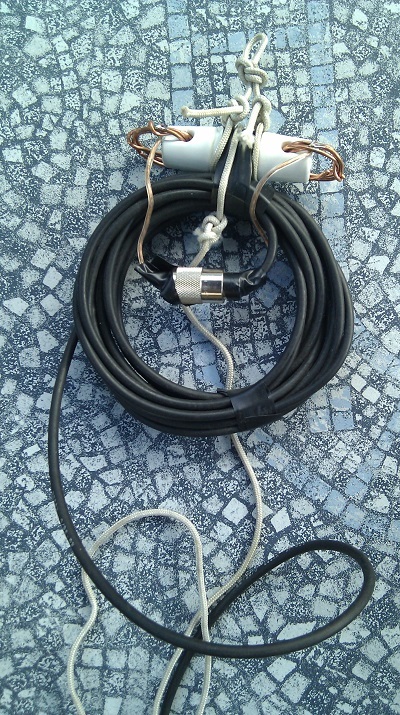 I made the feed system independent of the antenna elements by installing several loops of solid #12 copper wire on each end of the insulator. Antenna elements will be secured to those, as are the leads from the coax. The common-mode choke is wound from RG-58 for two reasons. Weight of RG-213 was a concern due to the stress on the pulley-drive system. I also wanted an effective choke that would work down to 40 meters, and that is difficult for an air-core choke made from RG-213. The 12-turn, 11 cm diameter coil of RG-58 should be effective on 40, and work well up through 15 meters. There is another choke lower down where the RG-213 leaves the mast which, like the wire clamped to the aluminum mast, is there for possible future applications. There really is no need for a PL-259 on the feed side of the choke. Since the run of RG-58 I found in my junk box that was the right length happened to have connectors on both ends I left them there. I soldered leads from the connector to the insulator ends. At top is the loop of rope that connects the assembly to the pulley rope. It isn't clear in the picture so I'll mention that the rope goes around the insulator, not the more fragile RG-58 choke. The rope that hangs down is used to attach to the main run of RG-213 for strain relief. Because of the pulley system it is not possible to bind the feed line along the mast. As a result the weight of about 6 meters of RG-213 would otherwise stress the connectors and choke. This risks eventual failure of the cables or connectors. One thing that proved to be a problem in the overall design is the difficulty of selecting the correct amount of pre-load tension to apply to the mast guys. The one that is most critical is the one opposite the pulley since it feels the full weight of the what the pulley is supporting, plus the tension applied to the antenna wires. The other two guys help to center the mast and only see dynamic loads in high winds. I have had some difficulty judging the required pre-load. The key guy is one on the right (first picture above) that runs through the angle bracket extension. My design makes it is easy to adjust its tension using a step ladder on the ground. However the adjustment can only be done with the antenna lowered either part way or (better) all the way. A bit of bend in the mast looks unsightly but does not really have much effect on its strength. But that strength does depend on the integrity of that one guy. This is something I may have to address before winter arrives.